May the morning sweet and fresh breeze hit your ears. May you have someone you love, serve you morning tea. Anon, but I feel like I wrote it myself. 1. A Taste of Stockholm is an early summer festival that each year attracts hundreds of thousands of people with a shared interest in food and drink. This weekend, I’ll be one of those people. During the first week of June, Kungsträdgården, or ”King’s Garden”, is transformed into a party with culinary sensations and performances by many well known artists. Around 25 of Stockholm’s most exciting restaurants serve everything from the most traditional Swedish dishes to delicious treats from other parts of the world. I plan on tasting something from all 25 restaurants. Based on what I have been scoffing down lately, I don’t think it’s going to be a problem. 2. On Saturday night I’ll be chuffing off to Stockholm’s Concert House to hear Beethoven’s 8th and 9th Symphony. This isn’t mandatory, I am choosing to do this. Yes, I find classical music a joy and am gladly attending the concert. Beethoven, it’s not just a film. And his ninth symphony is direct off his greatest hits album, it’s the one that everyone knows, da da da da da da da da. Ode to Joy, the song we all had to learn on primary school recorder. 3. When it comes to parent-in-laws, I feel like I won the lottery. You couldn’t wish for two nicer, more supportive or fun people to be legally related to. All of my Weekend of Wonder is happening because they will be in town and helping us out with Bubba. I’ll be free to waddle around the city at my own pace and on Sunday, I’ll be waddling straight to Sturebadet, a fabulous and luxurious day spa. I’m allowing TSH to tag along and we are hoping to have some ‘us’ time before the baby arrives. ‘Us’ time will include lazing around pools, being massaged, wearing white robes and discussing how my Braxton Hicks contractions are going. Sunday bliss. 4. Ladurée has now opened in Stockholm! One of my favourite Parisian shops has arrived up north. With its delightfully packaged macaroons and gorgeous everything else, I will do my best to waddle down there too. Hope you all have a fabulous Weekend of Wonder! ← Boy, girl or chicken? Enjoy all 25 restaurants, girl! Waddle away. I have great in laws too! Happy they’ll let you have a weekend of wonder, and wooo, a spaaaaaa. Macaroons look delicious! Cannot wait! It is going to be great!!! Sounds perfect! I think if I jump on a plane now, I can make it in time!!! Enjoy the time, you guys deserve it. Wow, it all sounds just gorgeous. I can’t wait to get a report back and see some photos! Sounds wonderful. Even with the waddling ;-). The day spa sounds lovely. We have a similar festival here called A Taste of Charlotte that offers samples of food from our many restaurants. I love tasting all the different foods. Enjoy! Oooo A Taste of Charlotte sounds a bit tasty! Sounds great! We have a similar festival here called A Taste of Charlotte. Local restaurants offer up samples of their incredible food. Enjoy your weekend – it sounds lovely. Hope you enjoy the 25 restaurants! Sorry to heat that! It was the coldest weekend in 84 years, not the best for out door events…. i am soooo jealous, sitting in rainy Sydney on a miserable autumn day. sounds magical. Truth be told, you are probably warmer than us! 6 degrees and gale winds, my weekend of wonder turned out to be a weekend of wondering where summer has gone! Good day spa weather however! Ladurée in Stockholm?? How have I missed this news? Where is it? 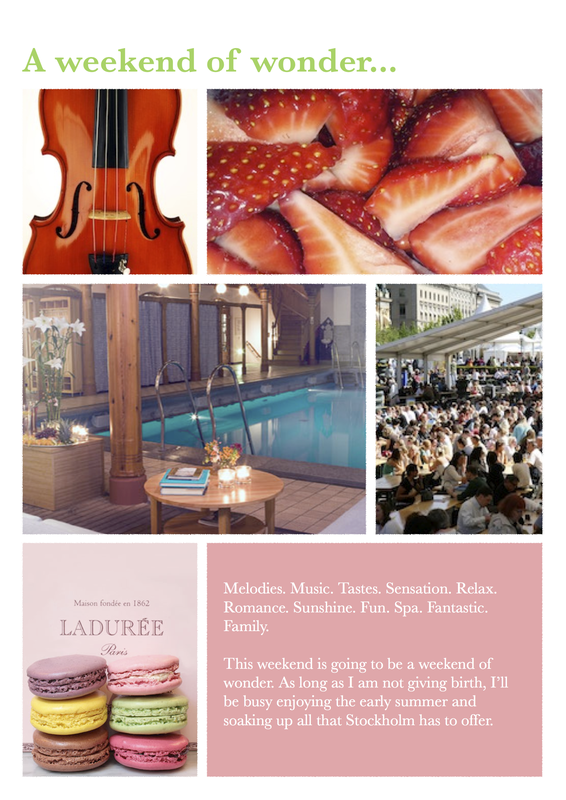 Enjoy the Beethoven and Sturebadet – bliss! I went there yesterday, it’s in Östermalm, highly recommended!!!!! Loved it! Hope it was all wonderful!